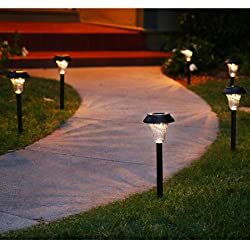 Landscape or Garden & Pathway Lights are one of types of outdoor lamps referring to the use of outdoor illumination of private gardens and public landscapes. This is used for the enhancement and purposes of safety, night-time aesthetics, accessibility, security, recreation, sports, and social and event uses. Why we should have Garden/pathway Lights right now? 1. Appearance: The obvious advantage to landscape lighting is the enhancement to your home’s appearance. The lights make your home and landscaping visible even after dark. When positioned properly, landscape lights make architectural features of the home pop out. Lights pointed at your favorite plants make the most of your landscaping at all times of night and day. Outdoor lights add a sense of drama to your landscaping. The illumination makes your house stand out by boosting the curb appeal at night. 2. Functionality: Landscape lighting increases the functionality of your outdoor spaces. With proper lighting, you can use your front and backyard long after the sun goes down. Flood lights attached to the house provide a large amount of general light to brighten a patio area or a portion of the yard. Lights attached to deck posts illuminate the area for late-night dining or conversations. For additional lighting around a patio table, special lights are available to attach to the table umbrella. 3. 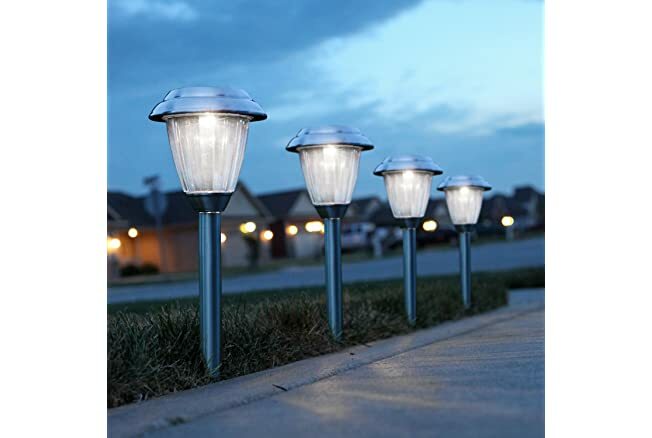 Home Security: The safety of your family and guests when outside or entering the home is another benefit of outdoor lighting. Home exteriors are full of potential dangers, like stairs, drop-offs, pools and tripping hazards. Lighting near those hazards makes them visible to prevent a fall or other injury. Lights that illuminate the driveway, walkways and house numbers allow visitors to find your home safely and with ease. 4. Cost Effective: Solar powered lights offer cost-saving benefits in three ways. First, they are generally cheaper than electrical garden lights are. Second, they are usually easy to use; therefore, homeowners do not have to pay expensive installation fees. Third, since they run on solar power, they do not add to energy bills. 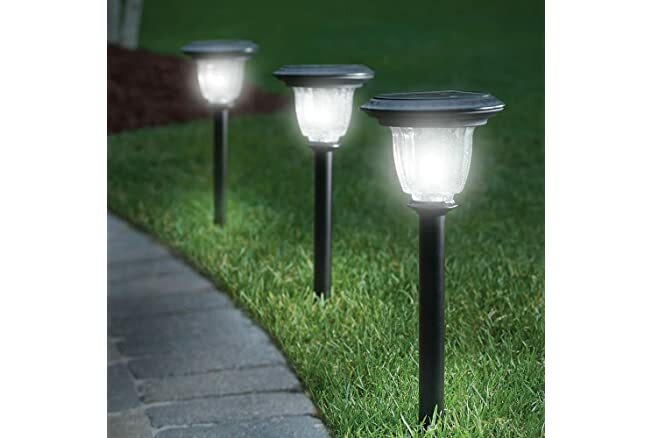 As such, solar powered lights provide homeowners with a cheap and effective way to light gardens and yards. 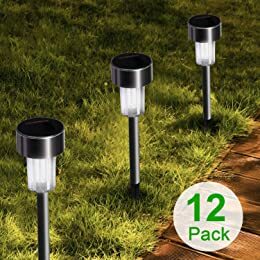 Additionally, the ease of installation and the ability to set up the lights in almost any location means it is a simple process to put up more solar lights in preparation for a big party or special occasion. Why we should use Solar Power for Garden Lights or Pathway light? 1. Solar is green, Green energy is totally the new rage, but it is also a way to look out for the future of our planet and reduce our impact. 2. Solar is a renewable energy source. The sun is always present and even the cloudiest days, there is a bit of insolation available for the solar panels to soak up. 3. Solar can be installed anywhere, even when what it is powering is in the shade. No matter what the circumstance, if there is a sunny spot nearby the solar can be installed to power something remotely installed. There is even technology today turning roofing or windows into photovoltaic sources. 4. Solar Energy is Durable. A silicon wafer is not durable itself, but stick it behind some glass and you have the making for something that can withstand a lot more of the elements. Best of all, as technology increases, the durability of the glass increases; check out SolarWorld’s Indestructable Panels. Other protection, such as protective panel backs, can be used to increase the durability of free standing solar power systems. 5. 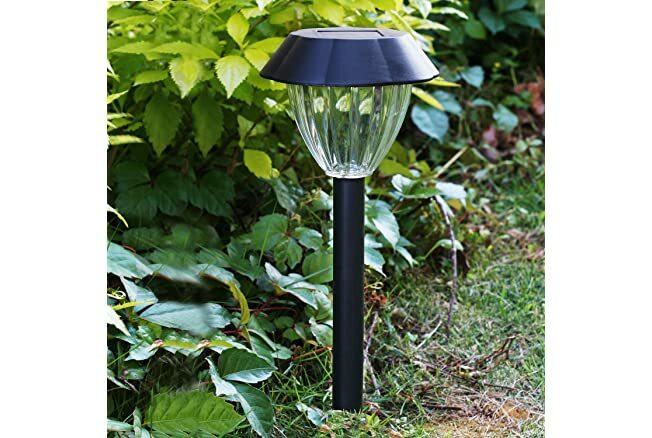 Eco-Friendly – Solar lamps in a garden are sourced from batteries that had been charged all throughout the day. So, illuminating these lights will mean no outward energy consumption. Thus, the environment remains as fresh as before. 6. Cost Savings – Solar provides cost savings by not having to pay for electricity, especially since electric costs continue to rise where the cost of solar continues to fall. Cost savings also can be calculated by eliminating the need to trench in grid power, disturbing surrounding landscapes and hardscapes, repairing areas, etc. 7. Easy Installation – Solar panels are easy to install, typically only needing a few bolts to hold them secure and some basic wiring. 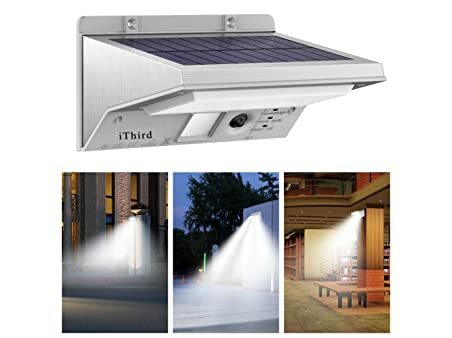 Solar lighting systems provide the solar power system at the top of the pole for most installation configurations, leaving all important electrical material at the top of the pole. Solar power systems can require a bit more for a simple installation; however, the low voltage DC power is much safer to work with than standard electric. 9. Battery Backup – Most solar systems today utilize a battery backup that allows for three plus days storage of the power needed to keep the system running (the best systems offer a minimum of five nights autonomy). That way, if the sun goes out, you will still have power for a couple days. 10. Safe Device – Solar lamps are safe as there is no requirement of any electric cable to lit them. Thus these can freely be used in barbeques and cookouts, avoiding risk of tripping over by children. These are still safer than candles or lanterns posing a fire hazard. Led Solar Garden Lamps need no electricity. No wiring is also required. Most solar lights have a built-in darkness sensor. It means there is no need for turning on and off. The solar cell should face south and be positioned on an angle making it perpendicular to the sun. The surface of the solar cell should not be shaded by foliage or structures during day-time. Solar Panel: Solar Panel converts sunlight into electric current. Its effectiveness depends on the size and quality of the solar cell and the transparency of the protective cover. It is the most expensive part of a solar light. Battery: The cells are wired to a rechargeable battery that stores the electricity. A diode located between the cell and battery make the electricity flow into the battery. NiMH batteries are used for their significant environmental benefit. Circuitry: This is the most crucial component that differentiates good ones from the bad. Wiring is the determinant and high-quality circuitry gives long-lasting and brighter solar lights. Housing: Housing of a solar light is UV-stable and weather tight. The solar panel is an integral part of the light avoiding separate mounting of the panel. It indicates that the panel may not be possible where best sunlight may avail. The Lighting product is designed with solar charging technology. Thus, there is no need to change battery. Use of solar technology is always eco-friendly. Use of best quality material has always been a boon to users. • The part requires assembly, but it is an easy process. Just all the parts are needed to assemble together. Direct insertion into the coil is made. Light cap is unscrewed and light switch is turned on. Then the machine will work normally. 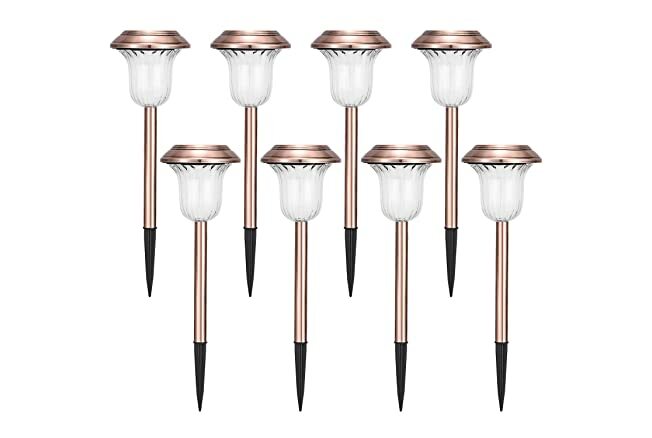 The product has specialty as it could emit 4 lumens of light in white shade to showcase outdoor landscape décor. It is a set of 6 products which are perfect for gardens, pathways, driveways, patios, parks and schools. • The harnessing of the solar energy has been very much useful as usage is easy and energy-efficient too. • The lighting sensor enables the bulb to automatically lit with raise of dusk. This will be off automatically with break of day. • Normal service time with a single charge is 8 hours. • The product needs assemble with the parts being assembled together. Being wireless, the solar light takes just a minute for full assembly. • Each of the products contains an on/off switch for battery protection and storage. The lights are fitted 12″ above the ground, 4″ below. • The company assures about satisfaction of the users. The sturdy construction brings out maximum positive reviews for the product. • Make in USA means there is no fuss about quality. The product requires installation, but it is an easy task. The product is also powered by solar energy thus eliminating the need for electricity. The use of sensor makes the light automatically on with the arrival of dusk and lights go off when there is daybreak. • The product is a weather resistant and suitable for outdoor uses. The user will be free from worries in case of rain, snow, frost, or sleet. • The installation is a easy process. It involves pushing the stake into the soil, which takes a few seconds. • The beautiful leaf shape of the lamp imparts a decorative and charming glow to the pathways. Thus, the garden space appears some heavenly oust. The product is treated as one of the most useful products. Recommended use of sensor makes the light automatically on with the arrival of dusk and lights go off when there is daybreak. • Use of high capacity battery can make the product work for additional hours. A single charge can be utilized for up to 10 hours. It means that the life is 20% extra to normal ones. • The materials used in the lamp are all weather resistant. Thus, these lamps can be used under all kinds of weather situation. The product is easy to install as no wiring will be required. No electricity is needed too; sunlight makes its way to recharge. A mere charge of 4 hours will give 8 hours illumination. Huge amount of energy is thus saved. This light will work unchangingly in all kinds of weather. There is a weather-proof jacket that works to guard weather effect. One first time switching on is required. The sensor will work for auto on and off successively. • Equipped with sensor that can go for auto on and off. The product is ideal for decorating your garden and lawn. This is also unique where conventional electrical supply is either inadequate or unavailable. This light is to keep away from the street lights or shading area to avert the effect on uses. The light keeps illuminating for 8 hours when full charge is given. They operate entirely on solar power and no wires and electricity is thus needed. These lamps are eco-friendly and get the energy for illumination from the sunlight. Installation is also easy. • No wiring is needed. • Ensures illumination and safety. This is among the best. Producing the brightest, longest-lasting, most expansive glow and generating 60 lumens for 12 hours. It is available encased in an attractive glass lantern. Its rustproof body automatically turns on at dusk, and the solar panel on top recharges in moderate to full sunshine. • Produces brightest, long-lasting and most expansive glow. • It is available encased in an attractive glass lantern. • Only one light is included. The product is designed with Vintage Look and Modern Simplicity. 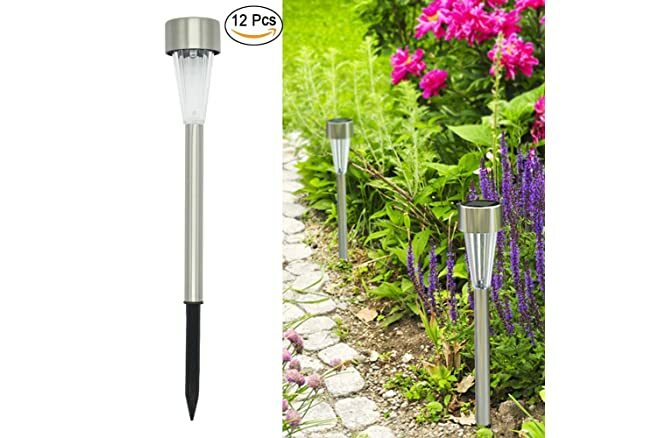 Garden or flower beds and pathways can be beautified with this pack of Eight White Light premium silver stainless steel LED Solar Accent Lights. Its transparent lens looks like glass and creates beautiful star-shaped pattern lighting onto the ground. It also adds some enchanted mood to your garden and turns it into a magical, romantic wonderland. • Eco-friendly with solar charging technology. 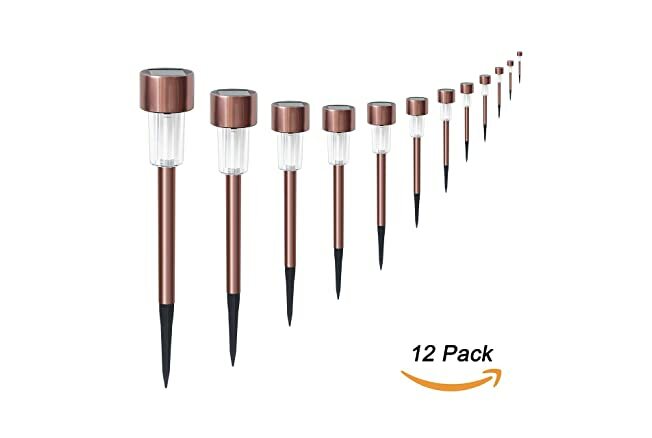 • Perfect for landscaping, accent lighting, walkway, and driveway, patio, or flower beds. This lamp set is ideal for beautifying garden spaces. Excellently looked that is blessed with simplicity. These lamps are solar-rechargeable, eliminating the need for power or wiring. They can illuminate for 8 hours in a single recharge. This product is weather-resistant and able to stand rain, snow, heat and ice. It is capable to provide an enchanted look to garden, flower-beds or wherever placed. Available in best prices, these products are blessed with a life-time guarantee. • An ultimate in beauty and safety. These lamps are powered by solar energy thus saves the cost of electricity. An on-of switch in the interior makes sure that switch will be turned on before charging. They are made from high quality stainless steel. The water-proof nature has enabled them sustain rain, snow, frost and sleet. 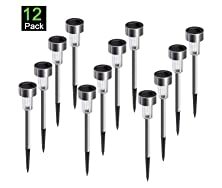 These 12-pack LED solar lights cast enough light, blends with patio with its classic versatile stripe thereby adding a charming ambiance. • These products are weather-resistant, making tension-free usage in rain, snow, frost and sleet. • Provide beautiful decoration in garden, porch, yard paths, and walkways. Voona solar path lights use world’s most efficient solar technology- SUNPOWER SOLAR PANEL. Sun conversion is much higher than normal panels to make us possible to enjoy longer lighting time. They are featured with quick and simple Installation. No electricity and thus wiring required saving cost on energy. Simply push stake into the ground and slide on the assembled lamp. • Their illumination cast a romantic shed in gardens, patio, lawn, porch, gate and yard. This elegantly designed solar light is made of beautiful stainless steel, improving its overall looks while also keeping it free of rust. Appear highly stylish when turned on at night. 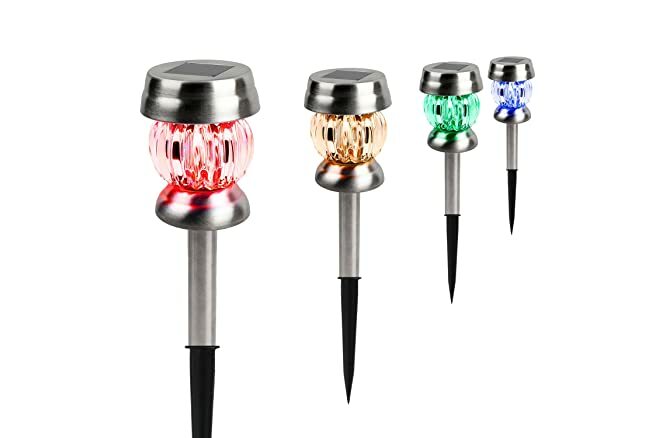 These solar lights are suitable for use in garden, lawn, villa, park, or yard at no power cost. Thus, no wiring required and even very simple assembly. Inner-built sensor turns on/off automatically. Improve safety on your property. • These products are all powered by solar energy. • These are featured with auto operation with an in-built sensor. • They offer resistance to the influence of bad weather and corrosion. • Easy installation as there is no wiring. 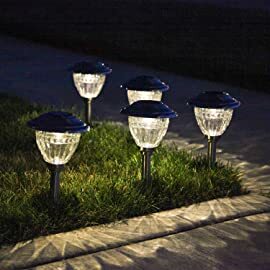 Voona solar path lights are unique as world’s most efficient solar technology named as SUNPOWER SOLAR PANEL is used there. Sun conversion is much higher than normal panels. It enables the user to enjoy longer lighting time. They are featured with quick and simple Installation. No electricity and thus wiring required saving cost on energy. Simply push stake into the ground and slide on the assembled lamp. 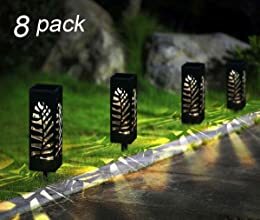 These unique designed solar pumpkin-shaped pathway lights provide matchless enjoyment at night. They emit light that change color frequently. Thus, they create fantastic and romantic atmosphere. Fit for use in garden, lawn, villa, tables, balcony, flowerbed and outdoor decoration. These beautiful decorative lamps may also be used as table lamp which can be placed in all outdoor or indoors without a stake. These pumpkin-shaped lights with delicate pattern will definitely add a special flavor for your garden and give it an extra elegant look. • In-built sensor provides with facility like auto on/off. • Besides lighting up, they provide special flavor for home. The solar path lights add a really nice touch to the landscaping. The High-Quality Solar Panel converts sunlight to recharge the built-in battery during the day. These lamps turn on automatically in the dark. These color changing lights looks beautiful and gives off a fantastic light onto the ground. 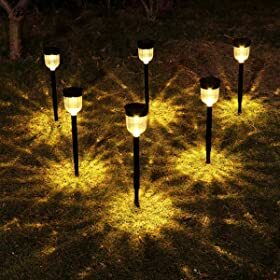 They are really unique lights to decorate and illuminate all backyard, garden, driveway, path, patio and lawn. This LED lamp is white, but with three colorful mosaic lampshades. It helps to emit lights like Blue, Purple, and Yellow turquoise. These shades add decoration, color, elegance and fun in the garden, patio, path and yard. They are made of high quality stainless steel. The lights have superior charming performance. Each of the light has 3-pieces including the lamp, pole and stake. They are assembled by placing the pole on the shade and inserting the stake into the bottom of the pole. • Automatically turn on at dusk and turn off at dawn. • The more sunlight the light gets during the daytime, the longer and brighter the light will shine at night. 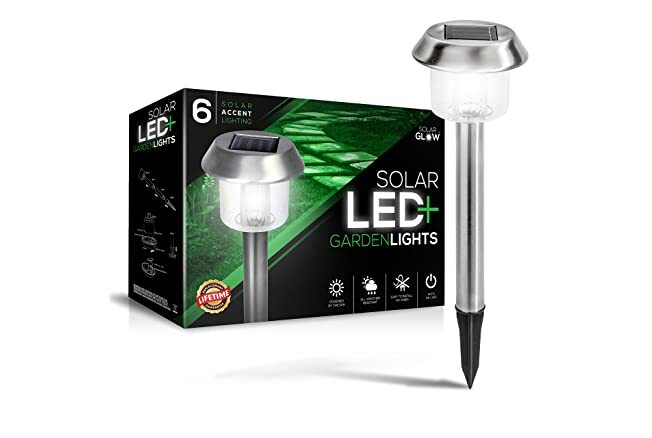 • The solar garden lights are placed in a nice sunny spot to make the solar panel get 6-8 hours of sunlight. 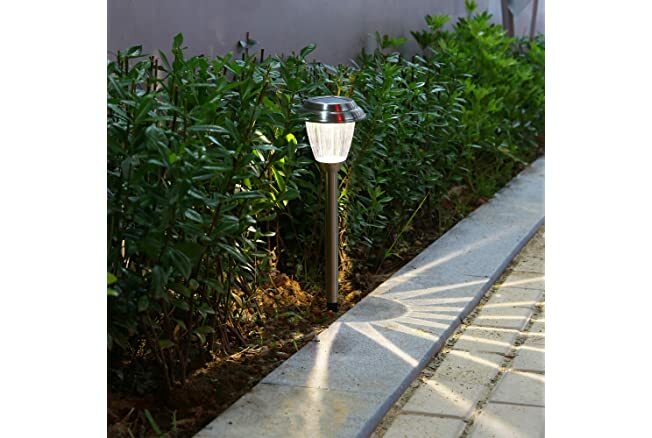 LED solar lamps are of greater use these days due their versatile uses. These lamps are run entirely on solar energy and thus require no artificially-made energy thus saving a lot on energy cost. 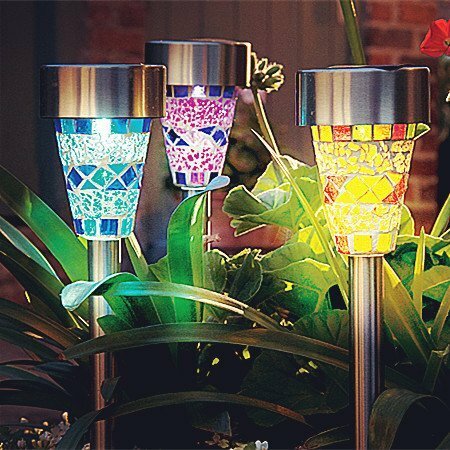 These lights improve the aesthetics of garden and patios. When the colorful small lights are placed in different parch-ways in a gala party, it simply intrigues the sense of beauty of the host. Nice Solar Pathway Lights !!! 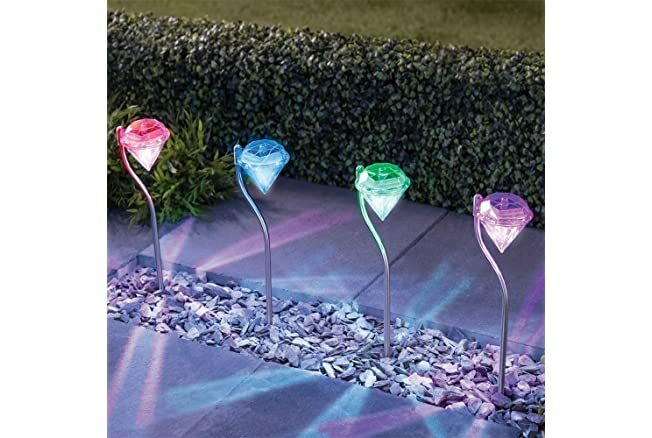 Thanks for sharing gorgeous Solar Pathway Lights . I think I’am going to be on the look out for more of these attractive Solar Pathway Lights by myself choice. Thank you so much for this wonderful article on outdoor lights. Am sure many people will be benefited from this.